Silicone Loaf Tin or Mould. Silicone 12 x Muffin Mould. Silicone Round Cake Tin /Mould. Or use to roll your pastry out on this. Pizza or Cookies?. Silicone Bakeware - 6 cupcake moulds. Use for cakes, bread, puddings, pies, and much else. Silicone Loaf Tin or Mould. 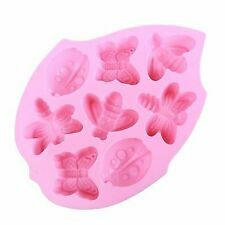 Silicone 12 x Fairy Cake/ Muffin Mould FULL SIZE NOT MINI. Perfect for cooking cookies or roll out your pastry on this. Silicone Round Cake Tin /Mould. Cupcakes and spoon will be a light blue. Silicone Loaf Tin or Mould. Silicone 12 x Muffin Mould. As you can see from the picture we have a variety of colours, we will send you a mixture. TWO Silicone Round Cake Tin /Moulds. Brighten up your kitchen. Silicone 12 x Muffin Mould. Silicone Round Cake Tin /Mould. Use for cakes, bread, puddings, pies, and much else. Silicone Bakeware - Flat Sheet Mat. This is a 3 piece set of Silicone Bakeware! While the silicone has a feel of rubber about it, it has none of the properties, so it does withstand the heat and cold, it doesn't perish and it DOESN'T flavour the food in any way. Silicone 12 x Large Fairy Cakes or Muffin Mould Use for Muffins or individual. 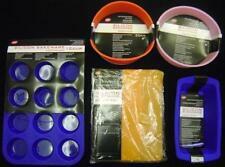 Silicone Round Cake Tin /Mould Make fruit cake or sponge OR a lasagne, toad in the hole, Roast Joint or Apple Pie! Pizza or Cookies?. 1 Silicone Mixing Spoon AND 1 Spatula. 1 Silicone Spatula and 1 bigger/ heavier spoon/spatula. 1 Round Pie Tin /Mould With fluted edges. 1 Round Cake Tin /Mould. Use for for all your mixing - can leave it in the bowl when microwaving. Silicone Bakeware - 36BLUE ,GREEN &PINK Cupcake Moulds. 36 individual moulds for cooking individual cakes. This will be done asap but within 24 hours. Also importantly it does not in any way affect the flavour/colour/texture of the food. 7 Different Tapas Dish. Shaped Tapas Dishes. The clamshell is 10 x 10 x 2cm (4 x 4 x 0.8"). the more the reduction. This will be done asap but within 24 hours. This is because when occasionally there has been a problem I have always tried to sort it out! Silicone Loaf Tin or Mould. Silicone 12 x Muffin Mould. Silicone Round Cake Tin /Mould. a pair of Silicone Tongs. a Silicone Spoon. This will be done asap but within 24 hours. Silicone Bakeware - Flat Sheet Mat. Silicone Loaf Tin or Mould. 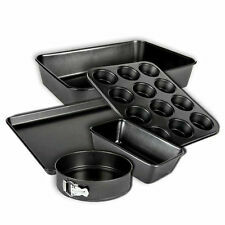 Silicone 12 x Muffin Mould FULL SIZE NOT MINI. 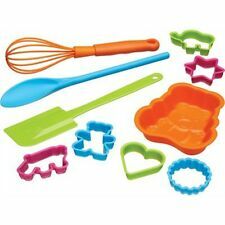 New Silicone Cake Baking Set. the more the reduction. This will be done asap but within 24 hours. Use for cakes, cookies, bread, puddings, pies, and much else. 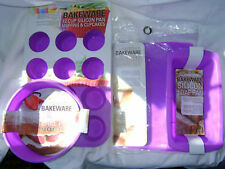 1 Purple Silicone 12-Mould Muffin and Cupcake Pan. 1 Purple Silicone Loaf Pan. The whole pan is 35 x 25 x 3cm (13.77 x 9.84 x 1.18"). Pan cooks a 21 x 11cm loaf (8.26 x 4.33"). They are also microwave-safe, so they're great for storing and warming up anything you might bake too! Silicone Loaf Tin or Mould. 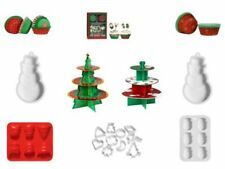 Silicone 12 x Muffin Mould FULL SIZE NOT MINI. Silicone Round Cake Tin /Mould. a Silicone Spatula. a Silicone Spoon. Silicone Bakeware - Flat Sheet Mat. Use for cakes, bread, puddings, pies, and much else. 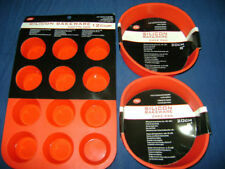 Red Silicone 12 x Muffin or Fairy Cake Mould or For 12 individual Yorkshire Puddings. Or roll out your pastry. 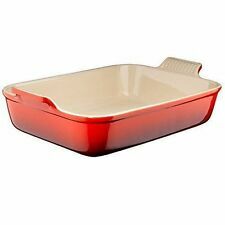 Red Silicone Round Cake Tin /Mould or For Large Plate size Yorkshire Puddings or Roast Potatoes. Blue Silicone Loaf Tin or Mould. 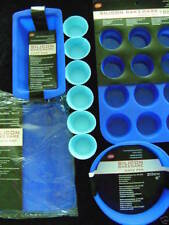 Blue Silicone 12 x Muffin Mould. Blue Silicone Round Cake Tin /Mould. Also importantly it does not in any way affect the flavour/colout/texture of the food. This will be done asap but within 24 hours. Silicone Loaf Tin or Mould. Silicone 12 x Muffin Mould. This will be done asap but within 24 hours. Silicone Bakeware - Flat Sheet Mat. Silicone Round Cake Tin /Mould. This is a 4 piece set of Silicone Bakeware! Silicone 12 x Muffin Mould. Silicone Round Cake Tin /Mould. Use for cakes, bread, puddings, pies, and much else. Silicone Bakeware - Flat Sheet Mat. This will be done asap but within 24 hours. This is a 3 piece set of Silicone Bakeware! Pink Silicone Round Cake Tin /Moulds Great for giant plate sized Yorkshire puddings, Lasagne as well as perfect for a Victoria Sponge Cake. Silicone 12 x Muffin Mould;. Or roll out your pastry on it! Silicone 12 x Large Fairy Cakes or Muffin Mould Use for Muffins or individual. Brighten up your kitchen! It's this bargain price because WE choose the colours! As you can see in the photo we have a variety of colours, we will send you a selection. 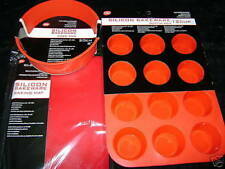 2 Silicone Round Cake Tins /Moulds. Silicone Loaf Tin or Mould. Silicone Bakeware - 6 cupcake moulds. The cupcakes, spatula and spoon will all be a light blue, we do have them in the dark blue. Perfect for baking cookies or roll out your pastry on this. Childrens Silicone 6 Hole Cup Cake Mould. Put in your frying pan add a little oil if you like, drop in your egg and hey presto a perfect round egg! Silicone Mini Cup Cake or Muffin Mould. While the silicone has a feel of rubber about it, it has none of the properties, so it does withstand the heat and cold, it doesn't perish and it DOESN'T flavour the food in any way.